Home » Blog » homepage » What’s so special about handmade gifts? Are you like me and treasure anything that has been handmade? Do you keep the rock your son painted when he was small? Or the jar craftily surrounded by glued sticks that chubby hands brought home for Mother’s Day? If you thought of your own sweet little gifts made by your children, then you understand the whole point of handmade gifts. Those types of offerings tug at the heartstrings and remind us of special memories. They are the gifts we cherish. As we continue to choke our waters with plastics and to fill our dumps with rejected items, it might be time to take stock of our gift giving habits. Are our gifts meant to last? Do they have meaning? Are there stories that can be told with these gifts? Zack’s Spiderman crocheted blanket – 2013. Wood slice custom pet portrait. When you buy (or give) handmade items, you are offering gifts that are carefully made by artisans or artists or some other creative. Their reputation is on the line and they want to make sure that you are absolutely delighted with the gift. Creatives work many hours, often alone, experimenting, honing their skills. Certainly, a one-of-a-kind gift is made with loving attention to detail. The recipient of the gift knows that you thoughtfully selected (or made) this item especially with him or her in mind, rather than buying a generic, manufactured gift. When you buy (or make) a unique item, you are expressing yourself with this item. As an example, I have shawls, socks, mitts that have been knitted by my mother, as well as by my several close friends. Each time I wear one of those items, I think of the time it took to select the yarn, and the colours they chose because they know which ones suit me. When I wear the shawl and receive a compliment, I am reminded of the maker, and of her hands swiftly and deftly working through the complexity of the pattern. Hand-knit mittens, socks, hats become more meaningful when the recipient knows that they have been in the mind of the maker while the item was being knitted. The selection of colours, the pattern chosen, all become much more significant to the wearer than even the clothing that has a mass produced designer label. And so it is with any handmade gift, even more so the ones brought home by our children when they are young. As consumers, we are subjected to ads that promote sameness. Everyone should buy this one toy, this one cereal, this one drink. The fad du jour. We all remember toys that were bought because they were suddenly "in" and every child wanted one. Adults even fought each other in department stores for one of these desirable toys. Then, a few months down the road, that same toy is abandoned for the next fad. More landfill. When we buy a handmade item, we are teaching our children to value something that is one-of-a-kind. It is an opportunity to tell them that the gift was made, not bought. In teaching them that not all gifts come from a store, we show them that they are capable of making things that are appreciated by others. I am writing this post on Black Friday. This quintessential American shopping day has finally become entrenched here in Canada. Five years ago, we almost never heard of Black Friday. Today, my email box was inundated with Black Friday sales. Everyone is jumping on the bandwagon. Some Canadians are even taking the day off to shop the specials. Don’t get me wrong; I love to shop as much as you do, and I do love bargains. It is the hype and the pressure to shop on that one particular day of the year that I dislike tremendously. I want to keep in mind the person receiving the gift, and the memories that will be associated with the gift. Will she think of the laughter we shared as childhood friends when she sees the photos of us I framed for her? Will he remember to call home when he feels the warmth of the scarf I knitted for him? OK, so I admit that the scarf was a bit of a guilt enducing gift. When I am rushed to buy a gift, I don't have the time to carefully select something that the recipient will treasure. To be sure, some store bought gifts can be memorable. Don't get me wrong here. I am not saying to forego store-bought items. But a handmade gift has that extra cachet of being unique, not made by the millions in a factory. Yoda At Christmas. Painted in 2017 and gifted at Christmas. The inspiration for my painted gifts. When gifts are significant, they are much less likely to end up in the landfill. Gifts that are valued, will be be treated with more caution. Children, if taught, will learn to value an unusual, unique gift. They will be more likely to keep the item in a safe place. It just might spend a few more years in the house than the plastic gifts that are often sent to the landfill after only a few months. They will learn the lesson that adults already should know: a gift given from the heart is one to be treasured. Watercolour birds given to a friend on her birthday. Canadian Vignette “We’ve Struck Gold”, gifted to godson and fiancée on their birthdays. Prismacolor pencil portrait completed 2014. Birthday gift. Prismacolor pencil portrait completed in 2015. Birthday gift. Prismacolor pencil portrait completed in 2013. Birthday gift. 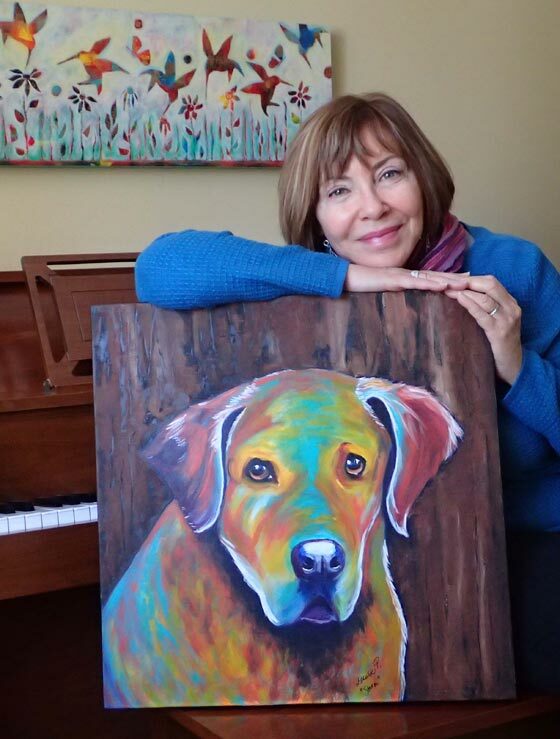 Donated gift to Ottawa Dog Rescue as a fundraiser event organized by local high school students. A sign painted on reclaimed wood as a gift for a friend’s birthday. Lego table gifted at Christmas and made by hubby. Advent calendar painted and colour coded for each child in 2015 and gifted that same year. Painted skate gifted in 2017. Gifted pet portrait in 2017. Georgie, gift for my American friend Linda, in 2015. Custom Pet portrait completed with Prismacolor Pencils. Finally, having said all this, when we are so busy with our many activities and family responsibilities, the gift of time is the most precious gift of all. Keeping this in mind for 2019, we are giving the gift of time to our family this year and bringing them with us to the sunny Caribbean for a week in January. It is no secret...they already know! Nine of us will fly to a resort that has plenty of soft sand, lots of activities, and hopefully, sunshine. We will be making more memories together. Hammocks swaying in the late afternoon breeze. Royalton Riviera Cancun. Hammock waiting for us at the Royalton Riviera Cancun. What are your most precious gifts? What handmade items have you bought or made for the special people in your life? Please feel free to share this post. We all need a little reminder from time to time that a gift need not always be of the store-bought kind. (Header photo by samuel holt at unsplash). A great post Louise! Christmas has become so commercialized over the years and this brings home a reminder that it is the gift of time and our labours of love that mean the most. I can remember, many years ago, receiving hand knit sweaters and hand stitched quilts from my grandmother. So much time and work went into making them and memories I will always have. Yes, I too have many handmade items in my home which I probably didn’t appreciate at the time they were given to me. Looking back, I wish I would have been more grateful for those gifts. I appreciate your comment…thank you!